But be prepared to pay a lot of money for them. 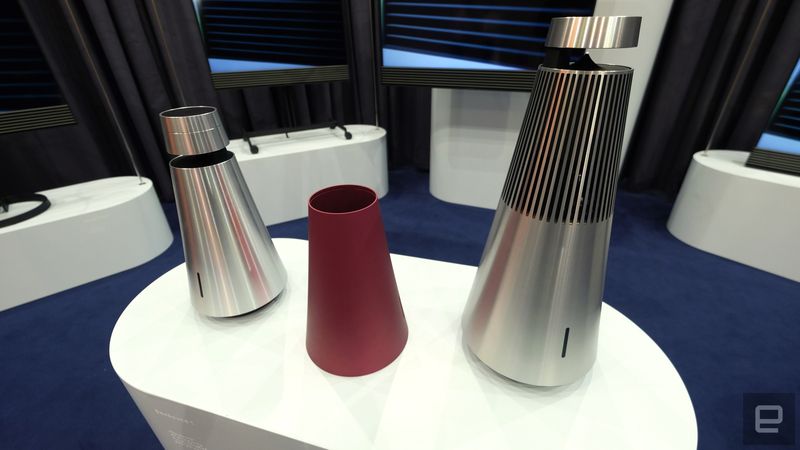 Earlier this week, Bang and Olufsen introduced its BeoSound 1 and BeoSound 2 multi-room speakers, and we just checked them out at IFA 2016. As expected, considering they both cost upward of $1,000 each, the new 360-degree speakers look stylish and unordinary. And while they do resemble Samsung's R wireless speakers, B&O's set is made with more premium materials -- namely "rock solid" aluminum, according to the company. The biggest feature of the BeoSound 1 and BeoSound 2, however, is the fact they can project sound all around you. That, in theory, should make for a more immersive experience when you're listening to any audio. On top of that, they can pair to other devices through AirPlay, Google Cast and Bluetooth. In other words, you won't have trouble streaming your music from a smartphone or tablet. One of the main differences between the BeoSound 1 and BeoSound 2, aside from size, is that the former comes with a rechargeable battery. The other, meanwhile, needs to always be plugged into an electric outlet. Bang and Olufsen says its main goal is for these to be unobtrusive in someone's home or office, hence the rather minimalist, lamp-like design. You'll have to break the bank if you want them, though. The BeoSound 1 and BeoSound 2 arrive in October for $1,495 and $1,895, respectively. That's a lot more than Sonos' best multi-room speaker, the Play:5, which itself isn't cheap at $500. It's definitely something to think about.